Tag Archive | "Cade Hall"
The Cedar Springs FFA Group that competed at the regional level. Pictured from L to R: Mr. Reyburn, Kaitlin Rounds, Diane Howe, Evan Young, Mykenzie Gage, Cecelia Brandt, Madison Strain, and Tanner Anderson. 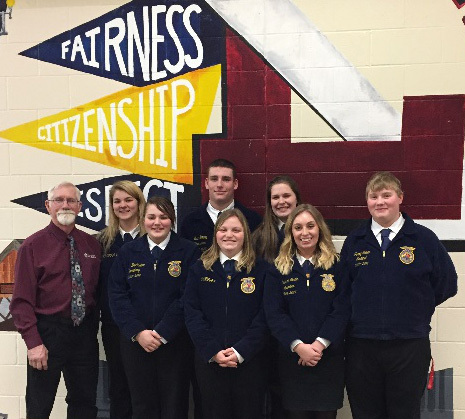 As National FFA Week approached, the Cedar Springs FFA sought new ideas to celebrate. This year, the chapter chose to raise money for a local family in their community. National FFA Week ran February 18 -25. The chapter extended a few of their events outside of FFA Week to raise money: a silent auction, a movie night at Kent Theatre, and a dinner at Culver’s. The silent auction was held at both Tractor Supply and Family Farm and Home in Cedar Springs. Many businesses participated by donating items or services for the auction. At Cedar Springs High School, the students participated in a Kiss the Piglet Coin Drive. Any teacher who wanted to take part in the event received a pig container, which held the change students dropped off throughout the week. The top five teachers with the most money will kiss a piglet on video; this video will later be shown to the entire school. The community also took part in a movie night at the Kent Theatre. Miracles from Heaven—a touching story about a little girl who was cured of a disorder after a terrible accident occurred—brought many community members out in support. Dinner at Culver’s allowed students to “work” for one night to raise extra money for the Ricker family; 10 percent of the evening’s profit will be given to them. Many students and community members came out to support the fundraisers. Instead of hosting events to promote FFA, the club decided to take a more meaningful opportunity to help a family in their community. Cedar Springs is a wonderful place to live and serve. Many of the same members who took part in FFA Week also participated in leadership contests a few weeks prior. Leadership contest were held at Beal City; the chapter was very proud of their participants. The results are the following: Ag. Issues-2nd place, Cecelia Brandt, Tanner Anderson, and Evan Young. Demonstration-2nd place, Diane Howe, Mykenzie Gage, and Kaitlin Rounds. Demonstration-4th place, Adam Parker and Cade Hall. Job Interview-6th place, Jeff Davis. Job Interview-7th place, Dylan McConnon. Public Speaking-1st place, Madison Strain. Public Speaking-5th place, Nathan Schoen. Congratulations to Madison, Evan, Cecelia, Kaitlin, Tanner, Diane, and Mykenzie for moving on to Regional contests. Regardless of the results, each member put in hard work and bettered their skills by getting involved. Now that leadership contests are over, the chapter is shifting their focus to Spring skills contests. they currently have a Livestock Judging team and a Forestry team. The FFA chapter has been busy serving their community while learning lifelong skills along the way. Thank you to the community members, businesses, and alumni for their endless support.